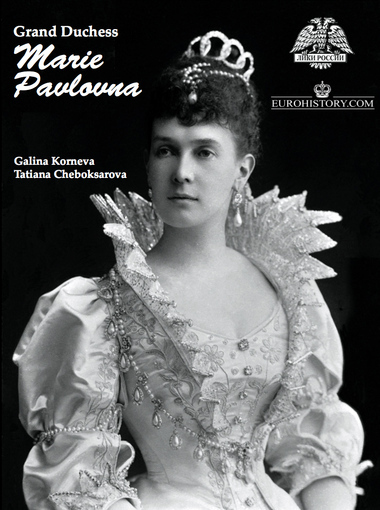 This new book-album is devoted to Grand Duchess Marie Pavlovna, consort of Grand Duke Vladimir Alexandrovich, to coincide with the 160th anniversary of her birth. She was a Princess from a minor German court, Mecklenburg-Schwerin, and became one of the most influential women in Russia and within the Imperial family. Her passion for jewelry and elegant dress is legendary, but she also took a great interest in other matters, including charities and arts. Hers was one of the surviving branches of the Romanov family, and her great-granddaughter is today the main claimant to the Russian throne. Marie Pavlovna’s daughter, Grand Duchess Helen, was married to Prince Nicholas of Greece and the mother of Princess Olga of Yugoslavia and Princess Marina, the Duchess of Kent. Hundreds of unique illustrations included. The authors, Galina Korneva and Tatiana Cheboksarova, have been working on this topic for many years. Back in 2001, their guidebook, Saint Petersburg Palace of Grand Duke Vladimir was published. One of the latest books written by these diligent sisters is titled Russia and Europe - Dynastic Ties, and is a lavishly illustrated. It deals not only with the Romanovs, but also with the many german dynasties that they married into.